Hinchinbrook Shire, an area of 2811 sq km, is generally 110 km north-west of Townsville. Its administrative centre is Ingham. The Shire was named after Hinchinbrook Island, now a national park of 39,350 ha, which is separated from the mainland by Hinchinbrook Channel. The most easterly point of the island was named Point Hillick by James Cook in 1770, and it was not until 1843 that the island was known to be separate from the mainland. The island remained unnamed until 1863, when Hinchinbrook was given to it. Mount Hinchinbrook, a point on a craggy range seen from sea between Cape Sandwich and Cook's Point Hillick, had been named by Captain Phillip Parker King in 1819; the relevant matter apparently was that the Earl of Sandwich, first Lord of the Admiralty soon after Cook's voyage, lived at Hinchinbrook in Huntingdon Shire. Ingham was settled in the 1870s and sugar plantations were established in the lower Herbert River Valley; the river empties into a maze of tidal creeks on the Hinchinbrook Channel. When the European population numbered barely 300 in 1879 the Herbert River local government division was created. Several sugar mills were in operation by the 1880s and two, Macknade and Victoria Estate, continue until this day. The successful sugar mills were about midway between Ingham and the coast, within reach of the wharf at Halifax. So important was the wharf facility to the local economy that Halifax was the principal settlement on the Lower Herbert. Its first hotel was opened in 1881 and it had the district's first newspaper. Inland, the Herbert River Valley and the adjoining plain were enclosed by heavily timbered ranges. They yielded valuable timbers until declared national parks in the late twentieth century. When the South Sea Islander indentured labour trade was stopped in 1890 plans were put into effect to bring in workers from northern Italy. Although opposed by trade unions, the immigrants were generally welcomed by the Herbert River sugar planters. The breaking up of the plantations enabled several Italian families to acquire small farms. Ingham was connected by railway to Townsville in 1919, giving readier access to southern markets. The Shire's population nearly doubled to over 10,000 between 1921 and 1933. The Abergowrie scrub lands upstream on the Herbert were gradually cleared for agriculture. 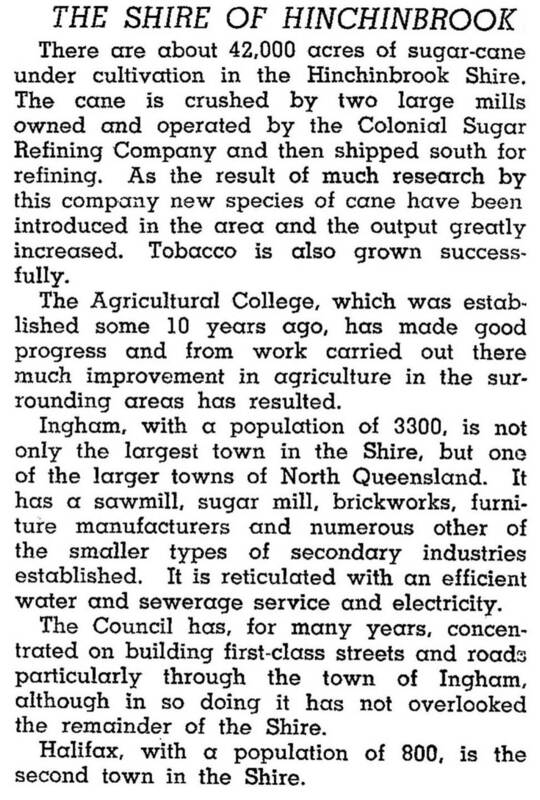 Tobacco and vegetables were successfully grown and north Queensland's sole agriculture college, St Theresa's, was opened in 1934. The Macknade plantation developed several successful strains of sugar cane during the 1930s, most notably the Trojan variety which had its first large commercial harvest in 1945. Hinchinbrook, Palm and Orpheus Islands were mentioned in promotional literature in the 1910s as worthy of visiting. Palm Island (see separate entry) was reserved in 1918 as an oppressive site for dispossessed Aboriginal people, but Orpheus Island was a minor destination with a guest house in the 1940s. Hinchinbrook Island was occupied seasonally by timber cutters and holiday makers. It was declared a national park in 1932, except for some special leases and scenic reserves. The whole island became a national park in 1960, although in 1966 a holiday resort on the island was proposed. Ultimately only low-key cabins were built. The inland ranges, already noted for waterfalls and mountain lookouts in the early postwar years came under several national park proclamations: Jourama Falls, Wallaman Falls (part of Lumholtz National Park, extending from the channel) and Mount Fox, a volcanic cone and also part of Lumholtz. Timber sources have been replaced by pine plantations. In 1994 over 40,000 ha were under sugar cane, producing over 3.3 million tonnes for crushing. (The Victoria Estate Mill is the largest in Queensland.) In addition, fruit, vegetables and other crops took up 8000 ha. Beef cattle (34,000 head) were grazed on the lower ranges and the valley flats. *Including tourists, visitors and 2098 on Palm Island, which is under a separate community council.